A highlight of T’s and G’s summer is a trip to Wroxham Barns, North of Norwich. It’s a stone’s throw away from the Broads boating hub at Wroxham. A rural collection of usual small, independent stores and workshops. We love a careful browse in the stained glass store, the old fashion sweet shop and I personally love a quick pop in to Sew creative; Today I realised I’m behind in festive Christmas planning, when T asked why we didn’t have a quilted advent calendar! There is also a small garden centre, clothing store and paint your own pottery. The main kid highlights are the farm and the fair. 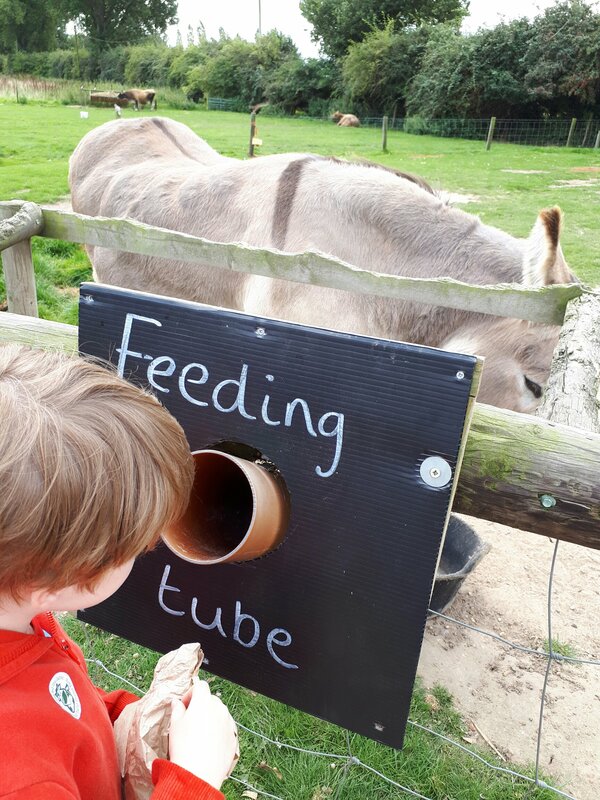 The farm is free for under 2s and £6.50 for over 2s. You get a wristband and can come and go as you please all day. Lots of sheep, calves, pigs (large and micro) and chucks (I was corrected by T 3 times that they were chickens!) to meet. 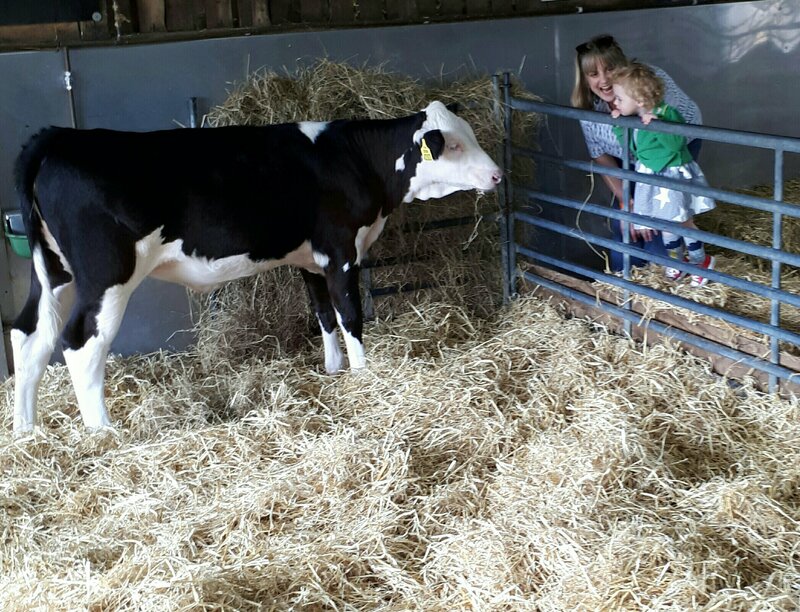 A timetable of activities is up; you can meet and feed the calves, meet the pigs and have cuddles with rabbits, guinea pigs and chicks. These sessions do get busy so arrive in good time. T loved it, G was a bit fidgety for handling a chick herself. She had a stroke when on T’s lap. I also would say long trousers would be good as T found the hay bales scratchy and the fur of the guinea pigs fuzzy! 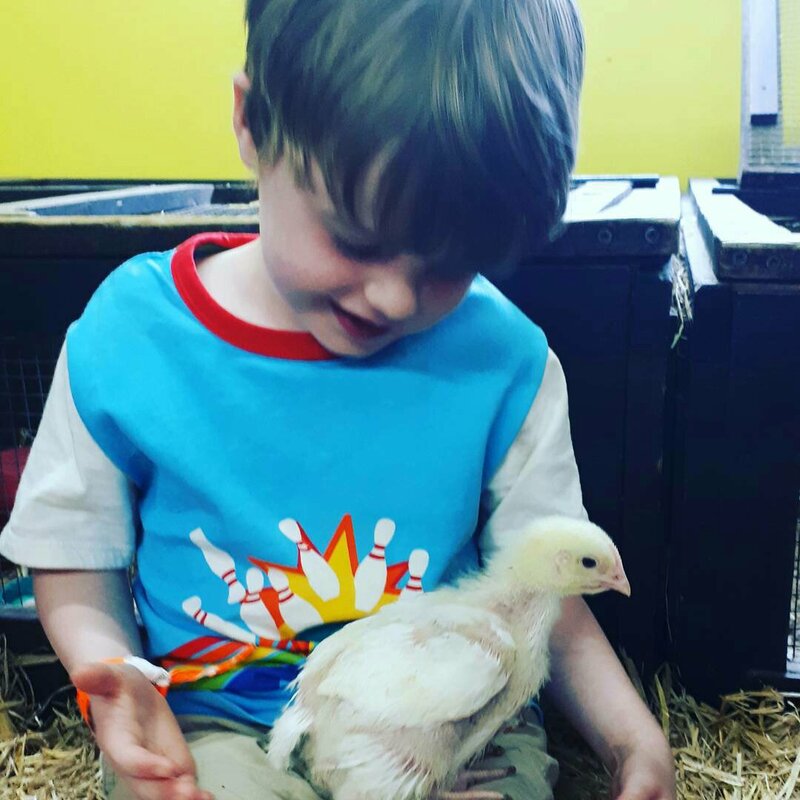 The staff and volunteers in these sessions are fantastic; making sure that every child who wants to have a cuddle can and that the animals are handled correctly and non stressed. In fact every member of staff was fantastic including the work experience gentleman who was cheering up G when she was a bit grumpy after a nap! There is a soft play area that has had a revamp since our last visit. It’s clean and the adult seating is along one side so you can see your child clearly. There is a wash hands station outside so you can have sparkly clean hands before and after. There are 2 main wash stations around the farm. Your wee ones will be stroking lambs and feeding animals so definitely a good scrub up to keep e coli and other bacteria away. There is a lot to do, as there is a tent up that has more activities like stencil face painting, craft, ride on toys and pretend play. T said the best bit was “gently stroking the chick and feeding the baby cow”. G’s best bit was the turkeys as she loved the sound they make and watching the chicks and rabbit. Top tip: Remember to wear socks for the soft play, I forgot mine! Kids and husband were ok thou. If you want to take part in grooming the horses you can do that but you must wear proper trainers or shoes. Nothing that shows your toes. There is a café but we left the farm area to eat a picnic lunch by the outdoor play area next door. The circus tent for the Foolhardy Circus show looked great; it’s on the list. Would we go back? Yes definitely. For 2 adults, 1 child and 1 under 2 and 2 bags of feed it came to just over £20. If you take part in everything and take a picnic I think it’s good value for money. We didn’t have time to go in the fair but apparently T is adding it to his October half term list. ← In-Loving the Little Bird 5 year celebrations.